Long-term rental listings in San Francisco jumped six-fold year-over-year the week following the city’s registration deadline for short-term rentals like Airbnb and HomeAway. Rent prices have been stable, as asking rents for new listings were in line with the overall market. The number of long-term rental listings on HotPads increased sharply the week after new limits on short-term rentals went into effect in San Francisco in January. Short-term rentals platforms Airbnb and HomeAway settled a lawsuit on May 1, 2017 allowing the city of San Francisco to proceed with new limits on some vacation rentals. The new rules were phased-in over the fall, but the final deadline for implementation was January 16, 2018. The number of vacation rentals available in the city fell following the deadline, according to Airbnb data cited in the San Francisco Chronicle. The following week, the number of new long-term rental listings on HotPads increased sharply, climbing six-fold from the same week a year earlier, according to analysis by HotPads Economist Joshua Clark. 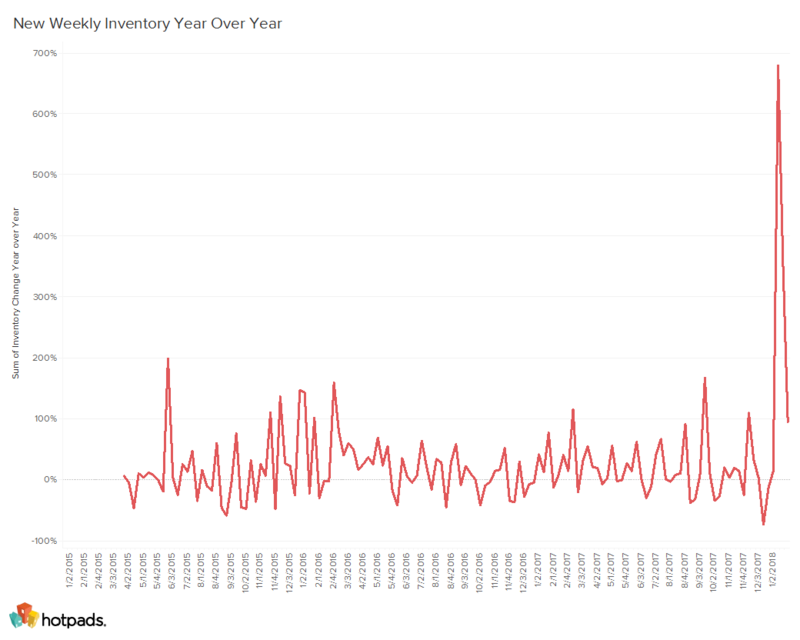 Typically, inventory climbs about 20 percent year-over-year. A year before the deadline, new rental inventory increased around 10 percent from the same week in 2016. The previous record year-over-year percent increase in new listings in a single week was around 200 percent, meaning that the increase reported the week that the short-term rentals law went into effect was more than three times larger than anything HotPads had seen before. In the third week of January 2018, new rental inventory on HotPads spiked 680 percent year-over-year in San Francisco. The jump coincides with the deadline for short-time rental hosts to register their properties with the city. Despite the surge in new listings the week after January 16th, the number of rental units on the market in San Francisco quickly returned to normal levels, suggesting that these new units were quickly absorbed. Renters searching for apartments in San Francisco temporarily benefited from additional options due to the increase in supply, but they probably did not notice any difference in costs. Most of the new listings were available at or near the city’s median rent – currently $3,800 per month. Methodology: HotPads looked at new rental listings added between January 16 and January 23, 2018. Rental listings that were previously on the platform 90 or fewer days before January 16 were not included. To control for the potential effect of new construction listings coming online during the week of the short-term rental registration deadline, HotPads did not include listings with a year-built date in 2018. To determine the increase in rental inventory, HotPads compared the number of new rental listings for a given week to the number of new listings in the same date range the previous year. 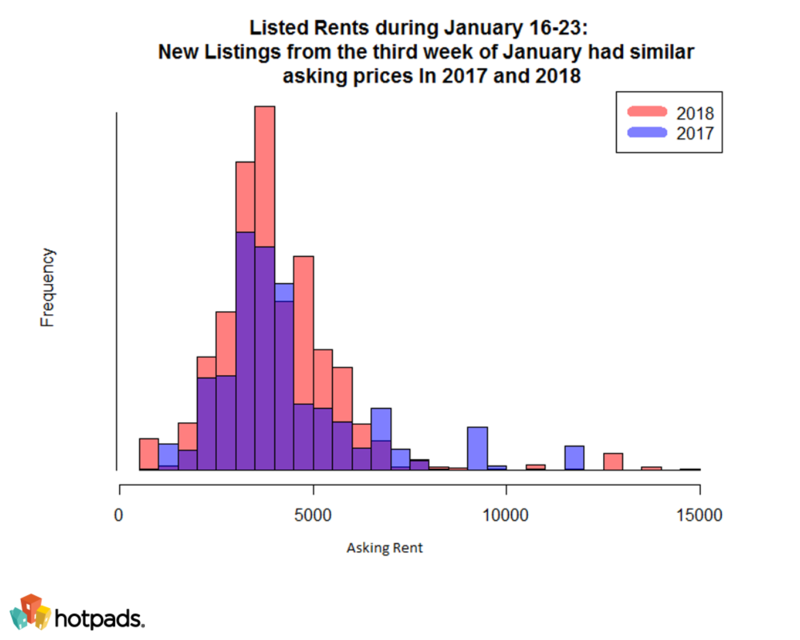 For example, for the week of the short-term rental registration deadline, HotPads looked at new rental inventory on HotPads.com for the week of January 16-23, 2018 compared to new rental inventory on HotPads.com for the week of January 16-23, 2017. HotPads does not publish exact inventory counts for any given week included in the analysis. For more information on San Francisco’s rental market, visit HotPads.com. For media requests, contact press@hotpads.com.